So…first things first! Audible is now a sponsor of this show, and is offering a free audiobook and 30 day free trial to their service to listeners. If you have never listened to an audiobook before, you can help support this podcast by giving their service a try. In addition to any free audiobook that Audible offers (amongst their catalog of 150,000+ titles!) you can also get a free review copy of either (or both) of my 2 latest audiobooks. I’ve got some free codes I’m happy to share with you on a first-come, first serve basis. The first book is Plugged: How Hyperconnectivity and the Beam Changed the Way We Think, and it was written by a fictional author named Sterling Gibson who is based loosely on Malcolm Gladwell. Sterling Gibson is actually a character in a series of books by Johnny B. Truant and Sean Platt called The Beam, and his book discusses societal trends in technology from the 1970s through the year 2097, when the story takes place. You can also find it on Amazon in print, digital and audio. As a side note, I interviewed Sean and Johnny back in Episode 7 if you’d like to learn more about the authors. The audiobook version is not yet available for sale, but if you’d like a free copy as soon as it is then just let me know and I’ll get you the details as soon as I can. The meat of this episode is all about how I actually produced those audiobooks, and how you can duplicate my setup to record your own audiobooks. Recording and producing audiobooks is actually not very difficult, but be prepared because it is time consuming. 01-03-12-Chapter12 – Terrible Scary Volume 01, story 03, chapter 12, and the description is “Chapter 12”. 00-4-Introduction – Plugged, chapter 00 (front matter), file 4, and the description of that chapter is “Introduction”. The actual details about how I perform each steps are in the transcript below or you can listen to the episode to hear me discuss them. I follow the ACX file quality submission requirements when I produce my audiobooks. I hope seeing my process is helpful for you in developing your own, or at least gives you an understanding of what is happening behind the scenes when you hire somebody to produce your audiobooks for you. Don’t forget, leave a comment or send me an email if you would like a free review copy of either of my most recently produced audiobooks (or, in the future, feel free to ask if I have any review copies for any of my books.) Reviews on Audible are even more important than reviews on Amazon for convincing people to give your book a try, and I’m happy to give away any copies that I can for your opinion on the books and on my performances. If you’ve never listened to an audiobook before, you can help support this podcast by signing up for a free trial membership to Audible.com after clicking on this link. Have you ever considered creating an audiobook version of your book? If so, would you hire somebody to narrate it for you, or would you record it yourself? In today’s episode, I’m going to walk you through my process for producing audiobooks so that you have an idea of what recording an audiobook entails, and so that you’ll have the tools to do it yourself if you feel so inclined. My name is Blaine Moore, and you are listening to the Modern Publishing Podcast, where we discuss everything about getting your message out into the world with the technology and markets available in today’s day and age. You can access a transcript of today’s episode and all of the show notes by going to mppcast.com/15. I have recently produced 3 audiobooks and am under contract for 2 more; the first book has already been published, a science fiction novel written as a social retrospective, is available for purchase at Amazon, iTunes and at Audible. The second book, an anthology of 3 children’s stories, is currently undergoing the publication process and should be available for sale within a month. I’ll talk more about them at the end of the episode, as well as how you can get a free review copy of either of the audiobooks if you want to hear what the finished product sounds like. You can also check the show notes for details at mppcast.com/15. So, why would you even want to produce an audiobook? There are currently millions of drivers in America alone who spend on average 26 minutes during their twice-daily commute, and people are getting tired of listening to the same music and the same ads and the same opinions on the radio. Now that smart phones have become more prevalent, and podcasting apps are coming pre-installed on the smart phones, and some cars are even including podcasting applications right in the dashboard, it is easier than ever for people to find audiobooks. Gone are the days of buying a box of 10 or 20 CDs to listen to a book. Now, you just point and click and the book gets downloaded to your phone automatically. Listening to audiobooks is one of the few ways that people can truly multitask effectively. If you are watching a video, or if you are reading a book, that’s really all that you can do. Sure, you could listen to a video in the background, but you would still be tethered to a screen somewhere. With audiobooks, you can listen while you are driving, while you are working out, while you are doing dishes, or while you are doing pretty much anything else that doesn’t require you to listen attentively. Because you are listening to a podcast, I probably don’t have to convince you about how awesome that is; you already know and are experiencing that benefit right now. Even if you are on the ModernPublishingPodcast.com website and listening directly through your browser, you know that you can download this episode and take it with you to pick up from where you left off at any time and while you are doing almost anything. So, providing an audiobook version of your book can make it easier for people to read your book, and can give you access to an entirely different demographic that may not even be interested in reading a physical book or an ebook. Once you have created your audiobook, how do you get it into the hands of your listeners? I’ve spoken about that previously on the show, go back to episode 5 at mppcast.com/5 to listen to the various marketplaces, websites and services that you can use to sell your books. I’m not going to repeat them here. For the books that I am currently (or have recently) worked on, they are being distributed to Amazon, Audible and iTunes through the Audiobook Creation Exchange at ACX.com. Now, producing your audiobook can be a little more work than just writing a book and making it available on Kindle. First, you have to record your audio, which while not difficult can be time consuming. On average, each hour of your audiobook will be about 9800 words, so a 50,000 word book will be over 5 recorded hours in duration. Not only that, but recording those 5 hours will actually take you more than 5 hours to do, as you will have to stop and restart many times as you make mistakes, and there will be some sentences in your book that you are going to regret ever having written as you try to say it correctly for the 5th or 10th or 12th time. As a sidebenefit, however, this is a great way to provide a high-level edit of your book if you can mark down those difficult passages and fix them in your manuscript later. If it’s hard to say out loud, it can also be difficult to read. By the time you are done with all of that, it is not uncommon to spend 3, 4, even as many as 10 hours of work for each completed hour of audio in your audiobook. When I first began producing audiobooks, it cost me about 5 to 6 hours per finished hour of audio; right now I’ve got a pretty good system down where it only costs me about 3 to 3 and a half hours of work for each finished hour. Taking that into perspective, a 50,000 word book is going to take at least 10 hours to produce if you really know what you are doing and are in the flow for most of your project, but more likely is going to take somewhere between 15 and 30 hours. However, if you get somebody that knows what they are doing to come help you out the first time, you can get some settings that are customized to your voice and your recording environment pre-packaged into a short checklist or even a preset in your software so that the actual process can actually be pretty straight forward. So…what is my actual process, and how can you duplicate it? The first thing you want to do is set up an appropriate recording environment. Ideally, you’ll record in a relatively small space with angular walls with sound-dampening siding so that you can reduce feedback and echo. This could be a professional sound booth, or something as simple as a closet full of clothes. For me personally, I actually record in an opposite environment; I have a relatively wide open area in my basement but record at an angle to the nearest wall. Unfortunately, because of where it’s located, I can’t record at all when my daughter is home, and try to limit the time I record when my wife is home because you can hear when people are walking around or talking upstairs, and any time the toilet flushes or the furnace kicks on I need to stop recording and redo whatever I was working on. Don’t worry, I’ll be sure to include a photo of my work area in the show notes so you can see how I have everything setup. You can get the shownotes at mppcast.com/15. As part of your setup, you are going to need a desk. Most people probably sit while they are recording, but I prefer to stand as it allows my voice to resonate and emote much easier as I’m not leaning over and crushing my diaphragm. I raise my laptop up off the desk on some bricks, mostly to get the right height for editing but also because my battery is shot and gets very hot so it’s nice to have some airflow beneath it to prevent the CPU fans from kicking on and making too much noise for me to record. I have a second monitor just to the side of my laptop, which I use for secondary editing that I’ll get to later in this episode. I keep my microphone also off the desk using some bricks, positioned right in front of my computer but near the side. You can actually get a decent quality USB microphone or headset for less than $50 or $100; what I use is a Blue Snowball Condensor microphone with a pop filter attached. On top of my laptop’s keypad, I put an old Kindle 3 keyboard e-ink reader, which can change pages with one button press and is far superior to trying to keep a book or sheaf of paper from making noise as I change pages. I’ve also found that on my Kindle Fire, if I don’t swipe just enough the overlays will appear, rather than changing the page, which would make it difficult to continue reading naturally as I change pages. So, the e-ink reader has won the day as my device of choice when recording. This setup allows me to look directly at the Kindle, with the microphone slightly off-set so that I’m not blowing air directly into it, and to see the recording software behind the Kindle without moving my head to look to the side. I also use some cheap ear bud headphones so that during the recording process, I can record over a few seconds and start talking again without an echo or feedback being created. This is essential for the Punch and Roll method of editing, which I’ll get into in a little while. I have an external keyboard attached to my laptop, as well as a stylus, although I leave the trackpad within reach for quick edits and only use the stylus when I have more detailed work that I need to do to the audio. The laptop keyboard itself would be very inconvenient to use so the external one is necessary for me to start and stop my recording. On the computer screens, I usually have 3 windows open. On the laptop, taking up the half of the screen that is not obscured by the Kindle, I have my recording software, Audacity. On my external monitor, I have my mastering software, Adobe Audition. I also keep a finder window open to the folder where I store all of the files for the book that I’m currently working on. My folder structure is pretty straightforward: I have a folder for the book I’m working on (or for the series I’m working on with the individual books one level down.) Inside that folder, I have a folder called WorkingFolder, and that’s where I save each of the individual files that I create in Audacity, usually one per chapter. There is also a folder called WAVFiles, which I use to export my WAV files. The final folder is my MP3Files folder, which is where I export my final MP3 files when I am done. Creating the MP3 files is the final step before copying to a smartphone, which I use to proof. I never edit the MP3 files; if changes need to be re-recorded or something needs to be edited, then I will edit the Audacity file. If I need to change something in the mastering step (or is among a limited set of edits that happen directly to the WAV file) then I will edit the WAV file in Adobe Audition. Then I will create a new MP3 file and test it again, and once it’s ready for primetime I’ll copy it into a “FinalFiles” folder beneath the MP3Files folder. My file naming is very important for tracking everything. Generally, I will named the files sequentially, for example, for a single book, I will have the chapter number dash file number dash description as the file name, so for example, 00-1-OpeningCredits, 00-4-Introduction, 01-1-Chapter1 etc. So, if the chapter number is 00, that means it’s front matter or chapters that appear before the first chapter. That way the number at the beginning matches up to the chapter number for finding the proper file later. For the file number, other than for front matter I rarely use anything other than 1 because the books that I have worked on so far have not needed to have individual chapters broken into multiple files. In a series books, I follow that same formula, except I’ll include the book number at the beginning, such as 01-00-1-OpeningCredits would be book one, chapter 0 (front matter), file 1, the opening credits. In special cases, such as an anthology of multiple stories, I will use that same syntax except that the first numbers will be the story number instead of the book number. For the Tales From the Terrible Scary children’s book series that I’m working on now, I actually have another level of file names – the book number, the story number, the chapter number, the file number, and then the description. I do keep each book separated into their own folders, but because they’ll later be combined into one super-volume that includes all 3 books in the 4th book, they still need to be able to be quickly and easily differentiated and placed in the correct order. This isn’t to say that you have to follow the same conventions that I do, but it pays to put a little forethought into your naming conventions ahead of time rather than having a headache of renaming files later, especially if you keep multiple backups and copies of files at different stages of the process as I do. Renaming the files and keeping them in sync is a pain later on; trust me, I know! I’ve had to do it. One suggestion you may want to implement that I don’t do is to include a short piece of the title at the beginning of the file, but I don’t bother with that as I keep them in different folders and at least for non-series books that won’t be mixed together it isn’t something to worry about. That may come back to bite me in the future, though, in the case of one of the books I produced, which is called Plugged, as I know there will be a sequel and if I am hired to record the sequel there could potentially be a boxed set down the road. But, I’ll cross that bridge when I reach it, and probably for new projects will begin including a short one word or couple letter descriptor at the beginning of the files for situations like that. To round out the discussion on the actual files themselves, remember to always have backups! Backup, backup, backup! And, where you can fit it into your workflow without messing yourself up, keep multiple versions of files on hand. For example, I’ve got the native Audacity files, the wav files, and the mp3 files for each chapter in separate folders, and will always make my edits as early in the process as possible when making changes. I also keep those files beneath my root Copy folder; Copy is a similar program to Dropbox, but without quite as polished an interface. Since I rarely access these files from more than one computer, I don’t need to have as reliable of file syncing as Dropbox offers, and since the files are very large, I wouldn’t really want them synced onto computers where I’m not actually using them anyway. What Copy does offer, is a throttled upload (because as I said, these are big files and uploading them full speed would kill my internet connection for the duration) and a lot more free storage space than Dropbox. They work off of a similar model, where you start with a higher base level of storage, and also get an additional 5GB of free storage for every referral rather than the half GB that Dropbox offers. They also don’t cap how many people you can refer. So, in instances where I want to synchronize files between computers, or want to share files with other users, I’ll normally opt for my Dropbox account instead of Copy, but in this case where I just want an automatic file backup to the cloud with revision history, Copy works perfectly well. In addition, I use CrashPlan to backup my computer, so the files are also backed up to the cloud there. I also have an external hard drive and will copy files there on occasion so that I’ll have a local backup; however, I’m not as diligent about that as I should be. I generally only bring that out when I’m ready to archive projects and get them off of my local computer’s hard drive, and that’s usually not for months after an individual project is done. The last piece of the work environment is the actual software that I use to produce my audiobooks. There are two primary applications that I use. For recording, I use Audacity, an open source audio program that can be downloaded and used for free on just about any operating system. This is what I use for actually recording my voice and for most of my editing. I also use Adobe Audition, which is not free but which offers more professional tools and an easier to use interface than Audacity. I do my final edits, the mastering of the files, and the creation of the mp3 files in Audition. The main reason that I use Audacity for recording is that the method I use to record is relatively easy in Audacity and I haven’t figured out how to do it in Audition, but the mastering tools and the exporting the final files are much easier in Audition than in Audacity. I’ll get into more specifics when I talk about those specific steps later. So, we’ve now finished setting up our recording environment; it’s time to move on to the actual recording process. The first step is to schedule a time when (ideally) I have the house to myself, so that I don’t have to worry as much about water running through pipes, people walking on the floors above my head, or any other noises associated with my wife or daughter being home. In the Winter, I’ll also turn down the thermostat so that the furnace doesn’t turn on as often; since I’m hanging out in my basement, it’ll ruin any recording as soon as it clicks on and it’s cold enough down there anyway that I don’t really need it running. I just need to remember to turn it back on in time to keep the house from being too cold when everybody gets home. My next step is to clean my mouth. That involves brushing my teeth, flossing, rinsing with mouthwash, and flossing. My dentist doesn’t like us to use mouthwash, and this is the only time I will use it, but by cleaning out any food particles I’m a lot less likely to have to deal with mouth noises while I’m recording. It’s the easiest way to reduce mouth noises, and the most effective after keeping yourself hydrated by drinking water regularly throughout the day. I also keep lip balm handy for right before I start recording. I will start the sessions with about 8 to 10 seconds of silence, or (more accurately) room tone. I’ll then save my file using the file naming conventions I mentioned earlier, and start by recording the chapter name and the first sentence or paragraph of the chapter. I like to keep a consistent amount of buffer in each chapter, so I’ll then edit out all but half of a second of silence before the chapter name, and 3 seconds of silence between the chapter and the first paragraph. 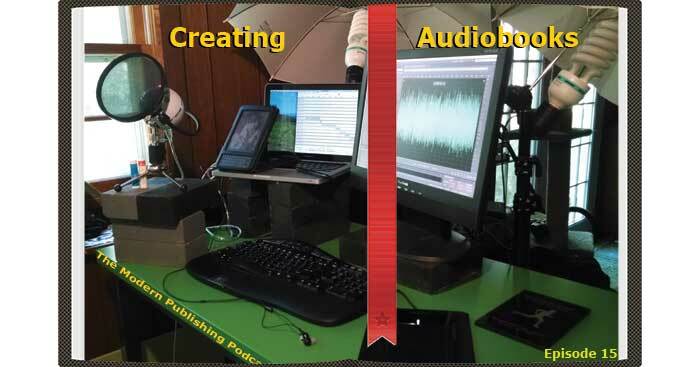 There are two primary methods for recording audiobooks. The first method is to just keep recording through all of your flubs and to use something like a clicker or clapping your hands every time you make a mistake, so that you can go back and edit out the mistakes later. This is a relatively easy process; you wind up with one track, the waveforms in the editing software will have sharp spikes every time that you made a mistake and started over, so you just need to visit each spike and figure out where to start cutting so that you wind up with one continuous take. If you have to re-record a section later, you don’t have to worry about speaking at exactly the same speed because you can split the track and insert your update in the appropriate place pretty easily. The method that I use for recording is called Punch and Roll, and I use that method because once you get used to it it involves a lot less post-production editing. Basically, every time that I make a mistake, I will stop recording, delete back to a place where it will be easy for me to cut back in naturally in the recording, and then place the cursor a few seconds further back in the recording and start a new track below. When I hit record, I’ll hear myself speaking the previous phrase or two and then can continue reading from the point where I deleted. I’ll include a photo in the show notes of what this looks like. There are some applications, such as Pro Tools, which makes punch and roll one-key-press; you hit the key, the last few seconds are deleted, a few more seconds are played back and you keep going. In Audacity, I achieve an efficient punch and roll by hitting the space bar to stop recording, using the track pad to highlight the section I wish to delete (and which is easy to note by looking at the wave forms of the audio for a short period of silence, ideally) and then will back up about 2 seconds for where I place the cursor. I press the “R” key to start recording again, and a new track is automatically created and I start recording again once I get to the appropriate space. I have not found an easy way to duplicate that process in Audition, which is why I use Audacity, but I rather like having the different applications for the difference processes of my audiobook as that makes it easier to backup and segment my files and to know exactly what I’m doing at any given time based on the application that I am in. When I finish recording a chapter, I let the recording continue to run for an additional 8 to 10 seconds to capture more room tone and because I’m going to want to eventually leave a 3 second buffer at the end of the chapter anyway. I will then save my work, which in Audacity I think is automatic as long as I remembered to save the file when I began recording but it never hurts to hit command-s any time you think of it. The final step in Audacity is to export a WAV file. I have not included sound effects in my books, or music for individual chapters; if I did, I probably would add them in Audacity before exporting to WAV, but I’m not confident I could create a good experience in an audiobook with the addition of sound effects so that is a case where I would hire somebody else, at least for the post-production if not all of the recording. I sometimes do include music during the opening and closing credits of a book, and in the case of the Terrible Scary stories I am recording I also include it in the opening of each story, but I don’t include it in the opening of each individual chapter. As such, I actually use Audition to add in the music, and only use Audacity to record the voice portion. Once I have a WAV file, I will open it in Audition. There will be one track in the WAV file, so I zoom into the end of that track where I have 8 to 10 seconds of room tone. I’ll highlight that room tone, press “shift-p” to capture a sample noise print, and then press “command-shift-p” to bring up and apply the noise reduction effect. You can also find those options under the Effects menu. Running noise reduction on a sample of my room tone will help minimize some of the noises present in my home from the house settling, the wind blowing, etc. Most people probably wouldn’t notice them unless they had really good headphones on, but it does make a small difference. The next step I will take is to trim the trailing room tone down to 3 seconds by placing the cursor 3 seconds after the last thing I’ve said and to highlight the rest of the dead air. You can then press the delete key to delete it so that there will only be 3 seconds of silence at the end of the chapter. The final “mastering” step that I take is to apply a few effects that I have saved in my Effects Rack. The actual settings that you will want for your situation are going to vary based on the room that you are in and your own voice, so I can’t give you be-all end-all values for what to apply with these effects. You can experiment on your own and see what sounds good, though. The first effect I apply is a multiband compressor. You can find it under Effects -> Amplitude and Compression menu. This effect will boost your voice to make it sound a little more powerful. The settings that I am using involve starting with the “Broadcast” preset, customized with −1.5 dB for the output gain and 2.0 dB for the band 1 gain. I wound up leaving the rest of the settings as the defaults. And again, you will want to play with the settings to see what sounds good in your own studio. The second effect that I apply is a hard limiter, which you can find in the same menu. This effect lets me set a limit for how much I can amplify any specific piece of audio so that it doesn’t get too loud for my listeners, while still allowing quieter parts of my recording to be amplified. I don’t think that I modified this from the default, but the values I use are −1.5 dB maximum amplitude, 0.0 dB input boost, 7 ms look-ahead time, and 148 ms release time. By combining these two effects, my voice will be much more even from start to finish, and the listener will be less likely to notice times when I may have turned my head a little or leaned a little forward or back. It will also make you sound a lot more professional. I will now save my WAV file with it’s edits, and then go to the file menu so I can export the file as an MP3. I use Audition to create the MP3 files because it uses the Fronhauffer media encoder; in Audacity, there is a plugin you can install called the LAME media encoder, but the final mp3 file’s audio quality suffers a bit without getting as good compression as when using the Fronhauffer encoder. If you decide that you don’t want to pay for Adobe Audition, I’d recommend taking the extra few minutes to encode your WAV files to MP3 by using iTunes, as it also uses the Fronhauffer encoder. Once the mp3 file is created, that chapter is pretty much complete pending a proofing phase (where I will listen to the chapter while I read along in the book and note any errors or unexpected sounds) and I will then go back and edit until I have the chapter complete to my satisfaction. Sometimes, there are no edits required, and sometimes I need to edit and recreate the mp3 file 3 or 4 times before I am happy with it. In a few instances, I’ve had to start over from scratch and re-record the entire chapter, mostly around the time when I got sick and was unable to record for 3 weeks straight and my sound quality had changed in the meantime. For the opening and closing credits, I follow a similar process where I record the credits in Audacity and export to a WAV file, but I will then do most of the editing in Audition, including adding in any music tracks that may play beneath the credits. In the case of these books, I then upload the files to the Audiobook Creation Exchange website, let the author know that his book is complete, and wait for him to approve the work. Once that is done, ACX will actually proof the book themselves, and then set it on motion to begin being sold in the various marketplaces. That process usually takes a few weeks to a month after I complete my recording. 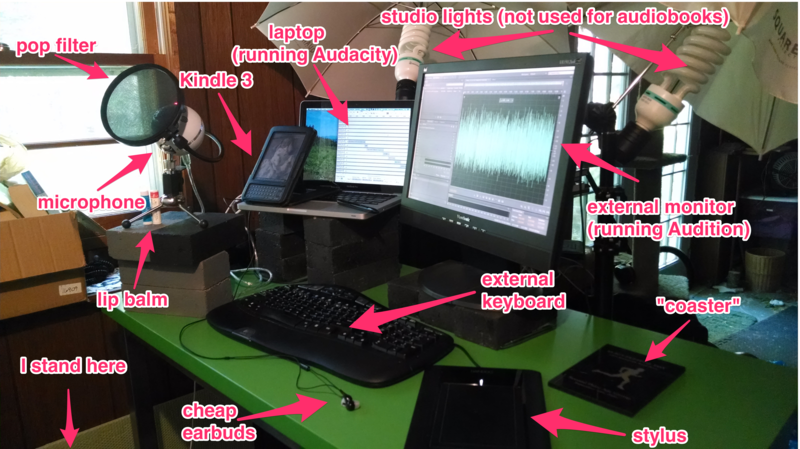 So, you now know my system for recording audiobooks. Would you like to hear how they sound, or are you interested in giving audiobooks a try? Audible has come on as a sponsor of this show, and they are offering a free audiobook to anybody who wants to give their service a try. Not only that, but I also have some review copies of my books that I would like to share with you, and are available on a first-come, first-served basis. Just leave a comment at mppcast.com/15 or email me for details and I will send you directions for how you can redeem your free review copy. You can signup for your free trial account by going to mppcast.com/audible and if you decide that you don’t like audiobooks you can cancel at any time in the first 30 days without being billed. So, what are the two books that I have recently completed? The first book is called Plugged, and it was written by a fictional author named Sterling Gibson who is based loosely on Malcolm Gladwell. Sterling Gibson is actually a character in a series of books by Johnny B. Truant and Sean Platt called The Beam, and his book discusses societal trends in technology from the 1970s through the year 2097, when the story takes place. If you’d like to order Plugged, you can find it’s listing at mppcast.com/plugged. The second book is called Tales from the Terrible Scary Volume 1, and was written by Guy Incognito. Obviously, that is a pen name, but the actual author writes dark horror books and doesn’t want the books he writes under his own name to be found by children that enjoy his children’s books. Tales from the Terrible Scary is actually a 3 volume series, and each book contains a short, medium and long story, for 9 stories total. A fourth volume collects all 3 volumes. We are currently waiting for ACX to approve the files and distribute them to the various retailers, so I do not have a link to volume 1 as of yet, but if you are interested in a free review copy of it (or of Plugged) just let me know and as soon as I can I will send out a redemption code to you. I have also finished recording volume 2 and am in the proofing phase, which I will hopefully complete this week, so volume 2 should be available sometime in July or August and volume 3 will hopefully be available this Autumn. The collection of all of the stories should follow shortly behind volume 3, as I will not have to do very much in the way of additional recording to complete it. And before I go, I’d like to thank Sandyjean01 for leaving a 5 star review on the podcast since the last episode, I’m happy that you found the podcast as well! Now if you enjoy the podcast, I’d appreciate it if you visited mppcast.com/itunes and left a review for the show. (Or, if you are listening to the show through Stitcher radio, you can leave a review at stitcher by going to mppcast.com/stitcher.) Leaving reviews helps others decide whether they want to listen or not and I’d like to think that if somebody is finding my podcast in iTunes that I would be a good show for them to listen to. Once again, this has been episode 15 of the Modern Publishing Podcast. A complete transcript and all of the show notes can be found at mppcast.com/15, and don’t forget that if you are interested in getting free review copies of my recently completed audiobooks to just let me know and I will get you directions on how you can do so. I hope that you have learned something useful about creating your own audiobooks in this episode, or at least understand one method that the process can work so you can appreciate why it costs as much to hire somebody to produce your audiobooks, and until next episode I hope that you have a fantastic week. There’s a lot of great information in here, most of which was way over my head. I will have to listen to this again and again until I understand the technical side of things. It is well done, with a lot of easy to follow information. The pictures help a lot too. Can’t wait to do my own audio books now! LoriSinclair Thanks for listening! Let me know if there’s anything unclear or unanswered questions that I didn’t cover. Great info and also very nicely narrated. Love the addition of pics and transcript. Super service. Reviewing an audiobook would be icing on the cake! Thanks.